10/31 Cup of Coffee: In a game called after eleven innings, Mesa and Scottsdale battled to a 5-5 draw on Friday evening. The Solar Sox scored four times in the top of the third to take the first lead of the game, punctuated by Chris Parmelee's (MIN) three-run homer following three singles. Scottsdale responded with a run in the bottom half of the inning on a double by Pittsburgh prospect Jose Tabata and a single by Arizona prospect Cole Gillespie. In the fourth, the Scorpions scored three times, driving starter Randor Bierd from the game. The three runs scored as a result of a single, a walk, a double, a throwing error and a sacrifice fly. He had given up 4 runs on 4 hits and 2 walks over 3.2 innings. Mesa regained the lead in the fifth on a Hank Conger (LAA) solo home run, but Scottsdale's Buster Posey (SF) homered in the sixth to once again even the score. The game remained tied for the next five innings before it was called due to league rules limiting contests to 11 innings. Mesa's best scoring opportunity came in the eighth, when the Solar Sox had two runners in scoring position with two out. David Cooper (TOR) led off the inning with a single and was replaced by pinch runner PJ Phillips (LAA), who advanced to second on a wild pitch. Ryan Kalish walked, and following a fly out by Jose Iglesias, both runners advanced on a ground out. With runners on second and third, Greg Burns (FLA) struck out to end the threat. Left fielder Kalish went 0 for 3 with two walks, while Iglesias went 0 for 5 in the contest. Mesa resumes play today with a 2:35 EST game against Phoenix on Saturday. 10/30 Cup of Coffee: The Javelinas scored twice in the eighth inning to earn a come-from-behind 3-2 win over the Solar Sox on Thursday afternoon. Mesa took a 1-0 lead in the bottom of the first, when Starlin Castro (CHC) scored on a Chris Parmelee (MIN) sacrifice fly. The Solar Sox extended their lead to 2-0 in the third, when PJ Phillips (LAA) scored on a sacrifice fly by Minnesota prospect Rene Tosoni. With two outs in the fifth and a runner on first, Richie Lentz replaced starter Andrew Miller (FLA) after he had given up the Javelinas' first run of the game. Lentz struck out Seattle prospect Carlos Triunfel to end the inning. He followed that up by pitching a clean sixth, adding one more strikeout to his total. With his team trailing 2-1 going into the eighth, Peoria's Brent Morel (CHW) led off the inning with a single. With one out, Triunfel walked and both runners then advanced on a John Gaub (CHC) wild pitch. Milwaukee prospect Lorenzo Cain singled, scoring both runners to complete the Javelinas' comeback. Dustin Richardson pitched a scoreless top of the ninth, allowing a single and a walk and striking out one before the Solar Sox went quietly in the bottom of the ninth, with Luis Exposito grounding to third for the final out of the game. Exposito went 0 for 4 in the game and Jose Iglesias went 0 for 3 and struck out once. Mesa plays Scottsdale tonight at 8:35 EST. 10/29 Cup of Coffee: The Mesa Solar Sox scored five runs in the first and led 11-0 after the fourth inning on their way to a 12-5 victory over the Scottsdale Scorpions Wednesday afternoon. The Solar Sox scoring started thanks to an RBI single by Josh Vitters (CHC), a bases-loaded walk to Steve Singleton (MIN), and a crushing two-out, three-RBI triple by Casey Kelly, who started at third base for Mesa. The scoring would continue in the bottom of the second for the Solar Sox, as they received RBI singles from David Cooper (TOR) and left fielder Ryan Kalish, expanding the Mesa lead to 7-0. Scottsdale was unable to stop the onslaught as the score would expand to 10-0 in the bottom of third, when Bryan Peterson's (FLA) sacrifice fly scored Kelly, and Starlin Castro (CHC) and Hank Conger (LAA) knocked in runs of their own. Singleton would open up the bottom of the fourth with a lead-off double and come home a batter later on another double by Kelly, giving the Solar Sox an 11-0 lead. Solar Sox starter Andrew Cashner (CHC) exited after four scoreless innings, allowing no hits and striking out four. With Cashner out of the game, the Scorpions pounced on reliever Steve Hirschfeld (MIN), who allowed a two-run home run to Steve Susdorf (PHI) and an RBI double to Chase d'Arnaud (PIT) to bring the score to 11-3. Scottsdale would add two more runs in the bottom of the sixth to make the score 11-5, as Brandon Crawford (SFG) hit a solo home run and Hector Gomez (COL) laced an RBI single. Chris Province came in to pitch for Mesa and stopped the Scorpions rally, pitching 1.1 innings of scoreless relief while striking out two. The Solar Sox would add an additional run in the bottom of the seventh as Peterson hit his second home run of the fall to give Mesa a 12-5 lead. Every player in the Solar Sox lineup collected at least one hit in the fifteen-hit performance. Kelly finished the game 2 for 4 with 4 RBI, a double, triple, walk and a run scored. Kalish was 1 for 5 with an RBI, run scored and a walk. The Solar Sox are back in action this afternoon at 2:35 EST against the Peoria Javelinas. Player of the Night: Casey Kelly, who was 2 for 4 with 4 RBI and a key first-inning triple. 10/28 Cup of Coffee: Despite jumping out to an early lead and out-hitting the Saguaros, 11 to 8, the Solar Sox lost yet another close contest, falling 6-5. Mesa got the scoring started in the first. After Rene Tosoni (MIN) reached base on an error and Jose Iglesias singled to open the inning, an RBI double by Chris Parmelee (MIN) made the score 1-0. After David Cooper (TOR) lined into a double play, Mesa center fielder Ryan Kalish picked up a two-out RBI on a deflected ball off the glove of Peoria first baseman Freddie Freeman (ATL), scoring Iglesias from third. Kalish then scored on an RBI double by Luis Exposito, making the score 3-0 Mesa after half an inning. The lead would hold up for three innings due to some solid pitching by Mesa starter Tommy Mendoza (LAA), but the Saguaros would strike back in the fourth on a three-run home run by Cleveland prospect Matt McBride, tying the game 3-3. Each team would gather two more runs over the next four innings to send the game to the bottom of the ninth tied 5-5. After Mesa reliever Blake Parker (CHC) got the first out of the inning, a double and two walks loaded the bases for Peoria. San Diego prospect Cedric Hunter then ended the game with a sacrifice fly to left. Iglesias ended up 1 for 5 in the game, while Kalish went 1 for 4 and Exposito ended up 2 for 3 with a walk. No Red Sox pitchers saw action in the game. Mesa hosts Scottsdale this afternoon at 2:35 EST. Brad Mills, the only man to have served as Terry Francona's bench coach in Boston, is leaving town to become the new manager of the Houston Astros. Mills, who was also Francona's bench coach in Philadelphia, takes over for interim head coach Dave Clark. Clark took over the team after Cecil Cooper was fired by the Astros on September 21, guiding the team to a 4-9 record to finish the season. A Major League veteran of four seasons in the early 1980s with the Montréal Expos, Mills managed for eleven seasons in the minor leagues with the Cubs, Rockies and Dodgers organizations prior to coming on board with Boston in 2004. This will be his first Major League managerial position. His son, Beau Mills, was the Cleveland Indians' first-round pick in the 2007 MLB Draft and finished last season with the Double-A Akron Aeros. 10/27 Cup of Coffee: The Mesa Solar Sox and Phoenix Desert Dogs engaged in a back-and-forth affair Monday. Victory wasn't in the cards for the Solar Sox, as they lost on a walk-off grand slam, 9-5. Phoenix got on the board early as Grant Desme (OAK) hit a three-run homer in the first, his eighth on the AFL season. Mesa would answer in the top of the second, as Hank Conger (LAA) led off the inning with a double. Steve Singleton (MIN) knocked home Conger and later came home on a P.J. Phillips (LAA) RBI single, cutting the deficit to 3-2. The Solar Sox would tie things up in the top of the fourth, as Phillips again knocked home Singleton, making the score 3-3. The Desert Dogs broke the tie in the bottom half of the fourth when consecutive triples by Corey Brown (OAK) and Jemile Weeks (OAK) plated two runs, giving Phoenix a 5-3 lead. Richie Lentz then came on in relief of Mesa starter Mike McCardell (MIN) and pitched 1.1 scoreless innings, striking out one. The Solar Sox brought the score to within one in the top of the fifth, when Conger's force out scored Starlin Castro (CHC), who had led off the inning with a single. The score stood at 5-4 until the top of the ninth, when Mesa rallied against Phoenix closer Drew Storen (WAS). Bryan Peterson (FLA) led off the inning with a double, and later scored on a two-out single by Chris Parmelee (MIN). With the score knotted at 5-5, Dustin Richardson came on for the Solar Sox hoping to send the game to extra innings. Richardson quickly got the first out, but allowed a Josh Bell (BAL) single and consecutive walks to Brown and Weeks. With the bases loaded, Nevin Ashley (TB) hit a walk off grand slam to give the Desert Dogs the victory. Jose Iglesias got the start at designated hitter and went 1 for 4. Luis Exposito entered the game in the bottom of the eighth as a defensive replacement and went 0 for 1. Mesa takes on the Peoria Saguaros this afternoon at 2:35 EST. Jed Hoyer, former assistant general manager for the Boston Red Sox, was officially named general manager of the San Diego Padres today. Following Hoyer's departure, there was a minor re-shuffling of the Red Sox front office. In a press release, the team announced that Senior VP/Assistant General Manager Ben Cherington will transition from his role overseeing scouting and player development to focus more on major league roster construction, professional player evaluation, and contract negotiations. Farm Director Mike Hazen and Amateur Scouting Director Jason McLeod, who previously reported to Cherington, will now report directly to general manager Theo Epstein. The Red Sox did not announce any replacement for the departing Hoyer. Jose Alvarez (Caribes de Anzoategui) threw 2.0 innings in relief over 2 appearances, allowing 5 hits, 2 earned runs and striking out 1. Enrique Gonzalez (Tiburones de La Guaira) started October 22 against Magallanes, allowing 3 runs on 6 hits, walking 2 and striking out 1 in 6.0 innings of work. Leandro Marin (Leones del Caracas) made two appearances out of the bullpen, throwing 1.1 innings, allowing 1 run on 3 hits while striking out 2. Yeiper Castillo (Aguilas del Zulia) made his first appearance on October 24 against Lara, going 0.2 innings and allowing 2 hits and a run. Juan Apodaca (Aguilas del Zulia) saw his first game action on October 23 against Caracas, going 1 for 4. Robert Coello (Algodoneros de Guasave), after working out of the bullpen in his first three appearances of the season, got the start against Mexicali on October 21. He went 6.0 innings, allowing 4 hits and 1 run while walking 3 and striking out 6. Yamaico Navarro (Tigres del Licey) appeared in three games during the week, going 0 for 6. Mark Wagner (Gigantes del Cibao) played in three games, hitting .400 with 2 home runs, 2 RBI and 3 runs scored. Jose Capellan (Toros del Este) made two starts, going 1-1 with a 2.79 ERA. In 9.2 innings pitched, he allowed 7 hits (1 home run), 3 runs, and 5 walks and struck out 4. Reynaldo Rodriguez (Leones de Monteria) appeared in one game, going 0 for 4. Player of the Week: Mark Wagner, who was very impressive with the bat, hitting home runs in consecutive games on October 21-22 and batting .400 in the three games he appeared in. 10/25 Cup of Coffee: After giving up a two-run lead in the bottom of the ninth, the Solar Sox rebounded with a run in the tenth inning to edge the Surprise Rafters, 4-3. Mesa took a 1-0 lead in the second inning when Ryan Kalish singled, went to third on a a single by David Cooper (TOR), and scored on a sacrifice fly. In the bottom of the third, the Rafters evened the score off Solar Sox starter, Randor Bierd, when Jeff Bianchi (KC) walked and scored on a Jarrod Dyson (KC) triple. Bierd threw 5.0 innings, allowing 1 run on 2 hits and a walk. He struck out 5. The Solar Sox regained the lead in the sixth when a Jose Iglesias single was followed by a Hank Conger (LAA) home run. Mesa took this lead into the bottom of the ninth only to see Ike Davis (NYM) and Brandon Laird (NYY) hit back-to-back home runs off Mesa reliever Blake Parker (CHC) to send the game into extra innings. In the tenth, Cooper homered to give the Solar Sox what proved to be the winning run. Kalish and Iglesias each went 1 for 5 and scored a run, and Iglesias also stole his second base of the fall season. Casey Kelly went 0 for 4 as Mesa's designated hitter, striking out twice. Player of the Night: Randor Bierd, who gave up just 1 run on 2 hits in 5.0 innings of work. 10/24 Cup of Coffee: Mesa saw its comeback fall just short as it dropped an 11-10 decision to the Peoria Saguaros. Trailing 10-4 going into the seventh inning, the Solar Sox narrowed the deficit to three when Chris Parmelee (MIN) hit a three-run homer. The Saguaros answered back with a single run in the bottom half of the seventh. Both teams went scoreless in the eighth inning, setting the stage for a dramatic ninth. Mesa's PJ Phillips (LAA) led off the inning with a single. Bryan Peterson (FLA) and Starlin Castro (CHC) were then walked, which loaded the bases with none out. Rene Tosoni's single scored Phillips, leaving the bases loaded for Chris Parmelee, who walked to score Peterson. Ryan Kalish entered the game as a pinch runner for Parmelee as the tying run on second, and there were still no outs. The next hitter, Hank Conger (LAA), grounded into a double play scoring Mesa's final run. Josh Vitters (CHC) grounded to third for the final out of the game. Chris Province entered the game in the third inning and recorded the final out. In the fourth, he allowed a run on a walk, a single and a sacrifice fly. He was charged with the loss. Dustin Richardson pitched a scoreless eighth inning, allowing 2 hits while recording a strikeout. Luis Exposito went 2 for 4 and hit a two-run homer. He also threw out a runner attempting to steal. Mesa will face off with Surprise this afternoon at 2:35 EST. Player of the Night: Luis Exposito who had 2 hits, including a home run, and 2 RBI. According to Sports Illustrated, Jed Hoyer, who was an assistant general manager of the Boston Red Sox, will be named general manager of the San Diego Padres. Hoyer joined the Red Sox in 2002 when John Henry became principal owner of the team. Hoyer is best known for becoming co-general manager with Ben Cherington when Theo Epstein resigned on October 21, 2005. Hoyer and Cherington completed the trade for Josh Beckett, Mike Lowell and Guillermo Mota in exchange for Hanley Ramirez, Anibal Sanchez, Harvey Garcia and Jesus Delgado. He also was vital in bringing Curt Schilling to Boston, famously traveling to the Schilling residence on Thanksgiving in 2003 with Theo Epstein to secure an extension, which completed the trade of Schilling to Boston. Hoyer graduated from Wesleyan University in 1996, where he was a standout pitcher. He holds the school's career saves record with eleven. Hoyer will be replacing Kevin Towers who was general manager of the Padres for fourteen seasons. 10/23 Cup of Coffee: The Scottsdale Scorpions pounded out nineteen hits on Thursday and coasted to an 11-1 win over Mesa. The contest was scoreless for the first three innings, as Mesa starter Andrew Cashner (CHC) held the Scorpions to two hits to that point. Cashner started the fourth and retired the first two Scottsdale hitters before giving up a single. He was then removed from the game by Solar Sox manager Brandon Hyde. Marco Albano (LAA) entered and promptly gave up a two-run homer to the first hitter he faced. Before the inning was over, two more runs had scored, giving the Scorpions a 4-0 lead. The Solar Sox replied with their only run of the game in the bottom of the fourth, as Rene Tosoni (MIN) led off the inning with a triple and scored on a one-out sacrifice fly. Scottsdale added seven more runs over the next four innings on its way to the lopsided win. Two Sox prospects saw action on Thursday. Ryan Kalish went 0 for 4 and struck out three times. Jose Iglesias went 1 for 2 and had a base on balls. In the sixth inning, Iglesias committed his first error of the season when he made a wild throw to first. Mesa squares off against the Peoria Saguaros at 2:35 EST today. 10/22 Cup of Coffee: The Mesa Solar Sox, who jumped out to an early lead, held off a late-game Scottsdale Scorpion charge to win 5-4 on Wednesday night. The Solar Sox started the scoring early, with Josh Vitters (CHC) doubling in two runs in the first inning off of Scorpions starter Michael Cisco (PHI). Mesa kept the pressure on in the second, when Casey Kelly led off with a walk and quickly stole second base. Kelly scored on a Greg Burns (FLA) triple, and Burns scored on a Bryan Peterson (FLA) double to extend the Mesa lead to 4-0. Scottsdale would answer back in the third, as Thomas Neal (SFG) singled, stole second and scored on a force-out by Brian Friday (PIT), making the score 4-1. Mesa added the eventual winning run in the top of the seventh. Consecutive singles by Vitters and Welington Castillo (CHC) put runners on the corners. Buster Posey's (SFG) passed ball allowed Vitters to scurry home with Mesa's fifth run. The Scorpions, though, were not going to go away easily on this night, as they rallied for three runs in the eighth. Back-to-back doubles from Posey and Steve Susdorf (PHI) plated three and got the Scorpions within one. But Blake Parker (CHC) got the final four outs for the Solar Sox and sealed the victory, earning his second save. Richie Lentz pitched 2.0 scoreless innings, allowing 1 hit, 1 walk and a wild pitch while adding a strikeout. Kelly went 0 for 3 with a walk, 2 strikeouts, a run scored and a stolen base. Mesa faces off against these same Scottsdale Scorpions this afternoon at 2:35 EST. 10/21 Cup of Coffee: Despite jumping out to an early 6-2 lead and attempting a furious ninth-inning rally, Mesa once again came up short against Peoria, dropping a 14-10 decision Tuesday afternoon. The scoring started in the first for Mesa when Ryan Kalish doubled home Bryan Peterson (FLA). Kalish would later score from third with the third Solar Sox run when Chris Parmelee (MIN) grounded into a double play. The Red Sox outfielder ended up 3 for 4 in the game with 3 runs scored, 2 RBI and a stolen base. Holding a 6-3 lead entering the bottom of the fifth, the game got away from Mesa in a hurry. Peoria scored eight times against Twins prospect Steve Hirschfeld and Marlins lefty Jay Voss to take the lead for good, with Andrew Lambo (LAD) doing the brunt of the damage with a two-out grand slam to conclude the scoring in the inning. Kalish would drive in his second run of the game in the top of the seventh to pull Mesa within three, but a two-out, two-run double by Lucas May (LAD) off of Chris Province in the bottom half of the inning would put the game out of reach. Dustin Richardson also appeared in the game, striking out the side in the eighth but allowing a run on 3 hits, including a solo home run to open the inning by Brewers catching prospect Jonathan Lucroy. Jose Iglesias and Luis Exposito each went 0 for 4, although Iglesias did steal a base. Player of the Night: Ryan Kalish, who went 3 for 4 with a double, 2 RBI, 3 runs scored and a steal in a losing effort. 10/20 Cup of Coffee: Despite out-hitting Peoria 10-9, Mesa fell to the Javelinas, 8-1 on Monday afternoon. Randor Bierd got the start and went 3.0 innings while taking the loss. He allowed 2 runs, 1 earned, on a sacrifice fly off the bat of Scott Sizemore (DET) in the first and an RBI double by Sizemore in the third. Sizemore, the offensive hero for the Javelinas, extended the Peoria lead to 5-0 in the fourth with his second double of the game, which knocked in two. The former fifth-round pick had a banner day, going 3 for 4 with 2 doubles and 4 RBI. Ryan Kalish put Mesa on the board in the bottom of the fourth, knocking in Chris Parmelee (MIN) with an RBI single. Peoria would extend its lead in the top of the eighth on a pinch-hit homer by Jordan Danks (CHW). Garrett Parcell (FLA) came in for Mesa in the ninth, but couldn't stop the Peoria onslaught, allowing a two-out single by Sizemore followed by consecutive walks to Russ Mitchell (LAD) and Danks before Dayan Viciedo (CHW) knocked home the game's final two runs. Jose Iglesias started at shortstop for Mesa, going 1 for 4. His average now sits at .444 through three games. The Solar Sox will look for revenge today, as the team once again plays the Javelinas, with the first pitch scheduled for 2:35 EST. Player of the Night: Ryan Kalish, who went 2 for 4 with a double and the Solar Sox' lone RBI. Each off-season, several Red Sox prospects compete in the Caribbean Winter Leagues, made up of teams from the Dominican Winter League (Liga Dominicana de Béisbol Invernal), Mexican Pacific League (Liga Mexicana del Pacífico), Puerto Rican Professional Baseball League (Liga de Béisbol Profesional de Puerto Rico) and the Venezuelan Professional Baseball League (Liga Venezolana de Béisbol Profesional). The teams in these leagues typically play into late December or early January, with each league sending its top team to the Caribbean Series, this year to be played in a twelve-game, double round-robin format in early February. To follow the Caribbean Winter League Red Sox player stats this off-season, visit our Fall-Winter League page, which is updated on a daily basis. In addition, this is the first in our series of weekly roundups of the Caribbean Winter Leagues - look for coverage to continue every Monday morning into January. This week's Caribbean Roundup covers the period of October 9-18, 2009. Look for expanded coverage when the Colombian Winter League gets underway on October 23 and the Puerto Rican League starts up on November 6. Note that the Colombian Winter League teams do not participate in the Caribbean Series, but we'll cover the league nonetheless, especially considering that newly-signed independent league top prospect Reynaldo Rodriguez is slated to play for Monteria in that league. Jose Alvarez (Caribes de Anzoategui) threw 4.1 scoreless innings over 3 appearances, striking out 2 and allowing just 1 hit. Felix Doubront (Navegantes del Magallanes) made a start on October 11 against La Guaira, going 2.0 innings allowing four hits and a run while striking out two. He'll be on a 30-inning limit for Magallanes. Enrique Gonzalez (Tiburones de La Guaira) started October 11 against Margarita, allowing 2 runs on 6 hits, walking 3 in 3.0 innings of work. He made his second start on October 16 against Anzoategui, turning in a sparkling performance in which he went 5.0 innings, allowing just 4 hits and striking out 8. Leandro Marin (Leones del Caracas) made an appearance out of the bullpen on October 15 against Margarita, recording one out. Robert Coello (Algodoneros de Guasave) threw a scoreless inning October 10 against Mochis. He also came on in relief October 14 against Hermosillo, allowing 1 run on 2 hits while striking out 2. He had his best performance of the week, though, on October 16 against Culiacan, throwing 3.1 scoreless innings allowing only 1 hit and striking out 4. Yamaico Navarro (Tigres del Licey) appeared in each of Licey's first three games, and hit .200/.200/.400 in 10 at-bats. In Licey's October 16 opener against Escogido, Navarro had 2 hits, a steal, and a run batted in. Mark Wagner (Gigantes del Cibao) made two starts, putting up a .200/.200/.400 line in 5 at-bats. Wagner is expected to see regular time this season for Cibao. Player of the Week: Enrique Gonzalez, who dominated Anzoategui in his second start of the week, striking out eight in his five innings of work. 10/18 Cup of Coffee: For the first six and a half innings, it looked like Mesa would suffer yet another defeat, but the Solar Sox erupted for five runs in the bottom of the seventh to stage a come-from-behind, 6-4 win over the Peoria Saguaros. Trailing 1-0 in the fourth inning, Mike Stanton (FLA) homered to tie the score. In the fifth inning, the Saguaros regained the lead, scoring two runs off Richie Lentz. He allowed two hits, a double and an infield single. The first run scored as a result of a throwing error by the Solar Sox catcher on a double steal and the second on a sacrifice fly. Lentz then pitched a clean sixth inning, fanning two of the three hitters he faced. Peoria added another run in the seventh to stretch its lead to 4-1. In the bottom half of the seventh, Mesa scored five times on a two-run homer by Cubs prospect Wellington Castillo and a three-run blast by Steve Singleton (MIN). Mesa relievers shut down the Saguaros for the final two innings to preserve the victory. Casey Kelly went 1 for 2 with two walks. He also scored a run. Ryan Kalish went 0 for 4 and struck out three times. 10/17 Cup of Coffee: Mesa dropped its third straight game, losing 7-3 to Surprise on Friday. The Rafters jumped on Solar Sox starter and Cubs prospect Andrew Cashner for three runs in the top of the first on a Brandon Laird (NYY) homer. The Solar Sox answered back with two runs in the second. Luis Exposito scored one of those runs. He singled, advanced to third on another single and scored on a sacrifice fly. He went 1 for 4 in the game. Chris Province entered the game in the seventh inning and allowed a run to score without giving up a hit. He struck out the first batter he faced but hit the next Rafter hitter. That runner advanced to second on a wild pitch and then to third on a groundout. The Surprise runner then scored on Luis Exposito's passed ball. The Rafters added three more runs in the eighth before Dustin Richardson entered the game to get the final out of the inning on a strikeout. Mesa scored once in their half of the eighth to cut the lead to 7-3. Richardson faced four hitters in the top of the ninth, allowing one hitter to reach on a walk and recording another strikeout. In the bottom of the ninth, the Solar Sox went quietly, with Exposito grounding into a 6-4-3 double play for the first two outs of the inning. Mesa squares off against the Saguaros today at 6:35 MST. 10/16 Cup of Coffee: The Surprise Rafters scored twice in the bottom of the first and never looked back, as they coasted to a 12-5 win over Mesa. Thomas Mendoza (LAA) started and took the loss for the Solar Sox. He gave up 3 runs on 8 hits in 3 innings of work. Sox prospects drove in four of Mesa's five runs in the game. Ryan Kalish went 1 for 2 with a walk and 2 RBI, driving in a run in the fourth inning with a sacrifice fly and singling in another in the eighth. Jose Iglesias hit a two-run homer in the fifth inning, his only official at-bat in the game. He had drawn a walk in the third and was hit by a pitch in the seventh, and was removed from the game after the next half inning. The Rafters' 18-hit attack was led by Brandon Laird (NYY), who went 5 for 5 and scored 3 runs, and Mike Moustakas (KC), who had 7 RBI. According to a Golden Baseball League press release, Boston acquired first baseman Reynaldo Rodriguez from the Yuma Scorpions on Wednesday and signed him to a minor league deal. A righty bat from Cartagena, Colombia, Rodriguez is a former Yankee farmhand. The 22-year-old hit .335 with six home runs and 74 RBI for Yuma in 2009, taking home the league's rookie of the year honors. 10/15 Cup of Coffee: A day after easily handling Phoenix 10-6, the Mesa Solar Sox were downed by the Desert Dogs, 4-2. It was a quiet night for Red Sox prospects, as only Luis Exposito was in the lineup as the designated hitter, going 0 for 3 with 3 strikeouts and a walk. Mesa jumped out to an early 1-0 lead in the third as Bryan Peterson (FLA) homered to right. Richie Lentz entered in the third and pitched 2.0 scoreless innings, striking out 3 and allowing just 1 hit to keep the lead safe. Phoenix responded in the fifth, taking advantage of an error and two doubles to take a 2-1 lead. Peterson lead off the fifth with a double and eventually scored on a ground-out to knot the score at 2-2 after five. Trouble found the Solar Sox again in the top of the 6th as Brandon Waring (BAL) homered to put the Desert Dogs ahead, 3-2. An inning later, Chris Marrero (WAS) added an insurance run with his RBI single, extending the lead to 4-2 for Phoenix. Highly regarded Nationals prospect Drew Storen came in for the save in the ninth, allowing a lead-off double to Ryan Mount (LAA), but shutting the door on the Solar Sox to earn the save. Mesa out-hit Phoenix 12-11, but left 19 men on base as they could not take advantage of scoring chances. The Solar Sox return to action this afternoon against the Suprise Rafters at 2:35 EST. Player of the Night: Richie Lentz, who struck out 3 batters and allowed only one hit, a lead-off double, in keeping Phoenix scoreless in the third and fourth innings. 10/14 Cup of Coffee: Tuesday marked opening day in the desert as the Arizona Fall League officially got underway, with five Sox prospects seeing action and helping Mesa down Phoenix by a score of 10-6. Randor Bierd (1-0) got it all started with 3.0 hitless innings, surrendering just one walk and striking out a batter. Bierd earned the win after Twins prospect Rene Tosoni staked him to a 1-0 lead with a solo home run to lead off the game. With Mesa leading 2-0 and a run already in with two outs in the top of the fourth, shortstop Jose Iglesias smoked an RBI double to left off of Nationals farmhand Josh Wilkie to add to the lead in what would become a four-run inning for the Sox. Iglesias, who was making his U.S. debut after defecting from Cuba and signing with the Red Sox, ended up 2 for 4 with a walk, 2 RBI and 2 runs scored in the game, also driving in a run with a single in Mesa's five-run sixth. The Solar Sox held a comfortable 10-4 lead going into the bottom of the seventh, but a two-run single by the Desert Dogs shortstop Danny Espinosa (WAS) brought Phoenix closer and put runners on first and second with nobody out. Dustin Richardson made sure the scoring ended there, striking out Brandon Snyder (BAL) and Grant Desme (OAK) before getting highly regarded Nationals prospect Chris Marrero to ground out to end the inning. Chris Province threw a perfect inning of his own in the game, while outfielder Ryan Kalish went 1 for 4. Cubs prospect Starlin Castro also had a good game at the plate, going 3 for 5 with 3 RBI. Player of the Night: Jose Iglesias, who went 2 for 4 with 2 runs scored and 2 RBI in his US professional debut. The Arizona Fall League begins today, and Richie Lentz has been added to the Red Sox contingent playing for the Mesa Solar Sox. 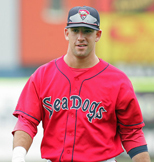 Lentz, originally drafted in the 19th round in the 2006 draft, split his 2009 season between Lowell and Portland. In nine games rehabbing with the Spinners, Lentz posted a 3.95 ERA with 26 strikeouts in 13.2 innings. While with the Sea Dogs, Lentz appeared in 29 games, posting a 6.75 ERA with 48 strikeouts in 36 innings. Lentz joins Randor Bierd, Chris Province, Dustin Richardson, Luis Exposito, Jose Iglesias, Casey Kelly, and Ryan Kalish as the Red Sox representatives playing in the AFL. Bierd is expected to take the mound today against the Phoenix Desert Dogs in the season opener. The AFL season runs from early October through mid-November, and generally features highly regarded prospects who the organization is looking to make big strides in the upcoming season. For more information on the AFL, check the SoxProspects.com Wiki. As has been widely suspected for some time, the New York Mets are confirming that Chris Carter (pictured) and Eddie Lora have officially been sent to the Mets to complete the trade of Billy Wagner to Boston. The trade, which occurred on August 25th, could not be completed immediately because Carter was on the 40-man roster and needed to clear waivers in order to be traded. However, he was claimed by the New York Yankees, delaying the completion of the deal until the end of the regular season. Carter, who spent the majority of his season in Pawtucket, was named SoxProspects.com Player of the Month for August/September of 2009, as well as a SoxProspects.com All Star at designated hitter. He compiled a line of .295/.358/.466 with 16 home runs and 61 RBI in 427 at-bats for Pawtucket. He was originally acquired in August 2007 from the Washington Nationals in exchange for Wily Mo Peña. Lora had been a member of the Red Sox organization for the past three seasons after signing as an international free agent in July 2006. In 2008, Lora was named the Red Sox Minor League Latin Player of the Year, posting a .300/.455/.492 line in a 120 at-bats for the DSL Red Sox. In 2009, Lora posted a .222/.287/.414 line in 34 games in the GCL. As many of you know, a tsunami devastated American Samoa last week, leaving at least 176 people dead and several thousand others wounded and trapped. I'm posting this to ask our readers to donate to help the victims in Samoa. Donations can be made at the Red Cross website or by calling 1-800-RED-CROSS. Below is a press release giving the latest details. Washington, D.C. -- Congressman Eni Faleomavaega announced today that he has been in close contact with the Federal Emergency Management Agency (FEMA) and the House Committee on Standards regarding donations for tsunami relief efforts. “As we make our way through this terrible tragedy, the U.S. House of Representatives and the House Committee on Standards has provided my office with a set of rules that we must follow regarding donations,” Faleomavaega said. In follow-up conversations with my office, Vai Sikehema stated, “As current and former players, we're pulling together our resources to help our countryman. We've gathered a group of former players to travel home to assist in the relief effort, even if it’s simply to rally morale, and we are grateful to FEMA, the Red Cross and Commissioner Roger Goodell and the NFL for their efforts and reaching out to help and bless our people." “I’ve informed Vai that we stand by to welcome and receive our NFL friends and truly appreciate what they are doing to keep attention focused on our needs. It is very important that we keep the media focused on this disaster since as fellow Americans we are in need of our nation’s support. Even though our fatalities do not number those like in Indonesia and other countries who have suffered massive losses, for the size of our population of only about 60,000, the destruction in the U.S. Territory of American Samoa is overwhelming for us. Our way back will be long and hard, but we are hopeful that our fellow Americans and friends from around the world will continue to be there for us until we fully recover from this devastating tsunami,” Faleomavaega concluded. On a going forward basis, the SoxProspects podcasts will be archived here. The latest podcast can be found here. Fifty-two players earned major league service time for the Red Sox in 2009, and fifty of those players saw game action during the season. Twenty-nine players who appeared for the Sox in 2009 earned a full year of major league service time: Dustin Pedroia, Jacoby Ellsbury, Victor Martinez, David Ortiz, Jason Bay, Kevin Youkilis, JD Drew, Mike Lowell, Jason Varitek, Nick Green, Rocco Baldelli, Alex Gonzalez, Julio Lugo, George Kottaras, Casey Kotchman, Jed Lowrie, Adam LaRoche, Josh Beckett, Jon Lester, Brad Penny, Tim Wakefield, Ramon Ramirez, Jonathan Papelbon, Hideki Okajima, Manny Delcarmen, Daisuke Matsuzaka, Takashi Saito, John Smoltz, and Billy Wagner. Miguel Gonzalez, who sent the entire season on the disabled list, also earned a full year of major league service time. A full year of service time is considered to be 172 days. Players earn service time for each day during the regular season that they spend on the active major league roster or the major league disabled list. While certain players may have spent more than 172 days on the active roster, 172 is the most days that a player may accrue in a single season. Additionally, if a player is optioned to the minors and then recalled in less than twenty days, those days spent in the minors are also counted in terms of service time. Twenty-two other Sox players earned major league service time in 2009. Each appeared in at least one game for the Sox, with the exception of Marcus McBeth.